Local SEO involves improving your Google My Business page ranking in local snack pack search results and Google Maps. Since a lot of dental patients research dentists online using a mobile device, local SEO is important to get new patients. Local SEO is similar to organic SEO in most things but there are some important differences. Citations, NAP consistency and patient reviews are vital for local SEO while they play minimal role for website ranking in organic search results. Every dentist should have a verified Google My Business page for their dental office. The page must have the correct practice name, phone, address, logo and website url, keyword optimized dental practice description, suitable business categories, at least 5 geo tagged photos and at least 10 patient reviews. 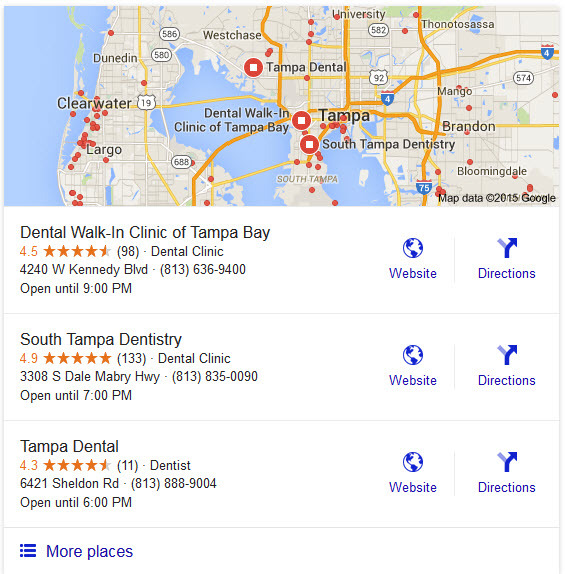 A number of things can be done to optimize your dental website for local search. The most important steps include using the city name in page title and content, adding office name, address and phone number on every page and contact page, using schema markup for local dentists and creating a separate page for each office location. In addition, your dental website needs some high quality, relevant back-links from established, local websites such as local businesses, chamber of commerce, news papers etc. Search engines like Google crawl the web to find and collect information about local businesses to serve accurate results to their users. One important factor used by Google to rank listings in local search results is quality and quantity of 3rd party citations. We help our clients verify and establish a presence on local business directories and dentist review sites to improve their ranking in local search results. In addition, we help them correct and remove incorrect NAP information, duplicate listings and old/outdated listings so that their dental office develops a powerful local presence online. While Google wants to deliver accurate business information to local searchers, they also want to show the best local businesses at the top. This is where patient reviews are important for dental practices. We help our clients get positive online reviews from their patients and thus improve their chances of ranking top in local search results.